I think it is naive to believe Honda acted altruistically. The Solar Farm was always part of their strategy and relied on the fact everyone was so pre-occupied with the Turbine issue that the Solar Farm went through on the nod. As for renewables in general what has to be realised is that this is an EU/IPCC directive, HMG have little or no control over the renewable targets. LA’s are responsible for ensuring carbon reduction targets are met by all businesses. It is perhaps ironic that those who probably believe the myth of man made global warming are the same ones who have objected to wind turbines, the consequence of the Al Gore Dooms Day scenario. So perhaps people should protest about the whole lie of MMGW and you may well then achieve a reduction in the need for renewable projects. There is some evidence that large scale Wind Farms can cause climate change, altering the kinetics of the wind (including speed and moisture content). Far fetched? 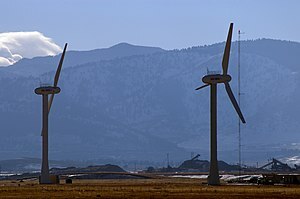 An area in China claims that it has suffered serious drought problems since a nearby wind farm opened and there has been a suggestion that the US could build thousands of on shore and off shore turbines down the east coast to try and cut the destruction from hurricanes by altering the climate, obviously this could deflect the hurricanes elsewhere. It is possible that the rush for free energy by wind farms is actually causing more climate problems than solving them. Reducing carbon dioxide levels doesn’t really solve greenhouse gas problems as water vapour is a much more significant greenhouse gas. There’s so much else to say about greenhouse gases that I’ve now had an e-book published called ‘Climate Change and Global Warming’ available on Amazon and Lulu and from my website at http://alastairnelson.webplus.net/. I’m on holiday staying in South Marston next week (July 9-13th)..
An interesting claim, that is almost impossible to prove. I think that you may have been extrapolating wildly from a recent scientific study. Don’t confuse local climate variation with global climate change. The Heat Island from urban development is much more significant on local climate change than the levels indicated here. On the plus side, I don’t think that the excess rainfall that you are likely to be experiencing during your upcoming stay in South Marston will be due to the wind turbines at Westmill. A further article pointing out some of the flaws with the ‘Wind Farms => Global Climate Change’, is here. The reality is that any alternative energy source is going to present problems. Over the past two years, there has been scientific investigation of whether wind turbines can affect the health of proximal residents, though the legitimacy of “Wind Turbine Syndrome”, as it was called, was widely questioned. Natural gas has its problems with fracking, nuclear energy with radiation, and even solar cells with electronic waste. This recent study was merely exploring a similar issue in wind energy, but only so that we might effectively deal with it. There have been a number of different studies on this topic. Some say that wind farms increase the temperature by 2c at, night others that temperature increases at night and decrease during the day. Some more recent ones indicate that temperature increases both day and night by 2c. Suggestion is that wind shear and friction are the cause of this increase. Really shows that you can prove almost anything by statistics. I have seen the results of one study which indicates that wind can be deflected upwards by wind turbines, but I’ve lost the website address, and can’t remember how high the wind reached. Perhaps some glider pilots could confirm or deny this? I am not actually against windmills in general, after all they have been around for a thousand years. Living in Scotland where there is a much higher number of wind generators (in proportion to the population), makes me wonder if this amount of generation should be encouraged or curtailed, especially as the latest turbines are going to be over 150 metres high (460+feet). To set the record straight–there can be no dispute that both solar farms and wind farms can produce a significant amount of energy. The difficulties arise when they are pushed through under the guise of benefit to mankind or the community. The facts however are quite simple. If constructed in the wrong place there can be numerous problems. For example the panels installed which were sneaked through planning that extended through our village. Did you see the comments in the Swindon Advertiser where Bob Feal-Martinez claimed to have aided that planning–which will create problems for future generations on the edge of the village. These panels are not what was claimed and are inferior panels manufactured by the chinese–sent to germany for filming and passed off as german technology-whilst every body was distracted by the debate about the Honda turbines. Those turbines never stood a chance of achieving planning and Honda had already invested in a significant amount of solar roofing panels. Honda are already at the forefront of Hydrogen Fuel Cell technology which could indeed revolutionise electricity generation and transport–the ultimate green fuel. On my recent visit to South Marston, I saw these panels in a field, Not really what tourists want to see. What people generally don’t realise is that wind farms and solar Panal arrays (like in South Marston) require the ground beneath to be dug up to connect them all to an electric connector for connecting to the National Grid (or to a factory). This can destroy field drains and contribute to flooding as the water will then go straight into rivers instead of being absorbed by the soil. Farms should be for crops NOT metal monstrosities.